Square feet and Watts - how it works? A rough calculation is that 100 watts of AC peak power require 12 square feet of roof space - or 1 KW requires 120 square feet. How much will a PV system cost for my 2000 square foot home? The cost of a PV system is not directly related to the square footage of a building. It actually depends on how much energy (kWh) you use per day and your location as well as how much sunlight you get. How long do the solar modules and batteries typically last? Most solar modules have a 20-25 year output warranty, but should last even longer since there are no moving parts. The average life of a battery depends on several factors; grade of battery (inexpensive golf cart to expensive industrial 2V cells), depth of discharge, number of cycles, temperature of battery and maintenance. To get the most out of your batteries, you should try to maintain them as close to 75° F as is practical and keep a good state of charge on your batteries while minimizing the number of deep discharge cycles. Also, an equalization charge (controlled overcharge) should be performed every 3 months or so followed by a replenishment of electrolytes. Electrolytes can be distilled water or gel based, depending on battery type. What loads can PV run and not run? Photovoltaic can power just about any electrical load. However, air conditioning and electric heating elements (cook stove, water heater or furnace) use large amounts of electricity which drives the system cost beyond the average homeowner's means. It is very easy to calculate your system size. First, you need to obtain your daily power consumption average in units of kilowatt hours (kWh). This power consumption will be listed on your electric bill. Use the instructions below to make this calculation if this average daily power consumption is not provided by your utility company. The number calculated for your Average daily kWh used can now be used in the exact system size can be calculated by our engineers. What will my solar electric system cost? A rough calculation is that, the installed cost for small systems (less than 5 kW) without batteries runs between $ 8 and $13 per Watt. For larger systems (over 10 kW) without batteries the installed cost is between $5 to $10 per Watt. For a small battery pack $1.75 per Watt should be added. For a large battery pack $3.50 or more should be added. What size system should I have installed? For most residential and small offices, a 1 kilowatt to 3 KW system should add some real value. For smaller homes and limited roof space, a 250 or 600 watt system can be installed. A rough calculation is that 100 watts of AC peak power require 12 square feet of roof space - or 1 KW requires 120 square feet. The small stand-alone system is an excellent replacement for propane or kerosene lights in a remote cabin, a recreational vehicle or a boat. The size of the photovoltaic (PV) array and battery will depend upon individual requirements. The actual sizing methods will be discussed later. The PV array charges the battery during daylight hours and the battery supplies power to the loads as needed. The charge regulator terminates the charging when the battery reaches full charge. The load center may contain meters to monitor system operation and fuses to protect wiring in the event of a malfunction or short circuit in the house. This system is the same as the previous one, except that it contains a DC to AC inverter, an electronic device which converts direct current into alternating current. With the addition of an inverter, commonly available household appliances such as power tools, vacuum cleaners, washing machines and kitchen appliances can be used. High quality DC to AC inverters are available with power outputs ranging from 100 watts to 11 kilowatts, and conversion efficiencies greater than 90%. To insure reliable system operation, the inverter should be carefully matched to the loads that will be run. As the loads on the system are increased, a larger PV array and more battery storage will be required. A stand-alone AC system will usually have a PV array of ten or more modules, battery bank and one or more inverters. Two or more stackable inverters are an excellent choice for this type of system since they can work together to supply power to large loads. If one fails, the others can continue to operate at reduced output until repairs are made. This redundancy is important for continuously operating critical loads, such as refrigerators and freezers. In large homes, an AC only system simplifies wiring by allowing the use of low cost, readily available switches, outlets, and fixtures. Savings in wire cost are significant, because the large gauge wire required for efficient transmission of low voltage DC power over long runs is avoided. The PV-generator combination system may be an economical alternative to a large stand-alone PV system, because the PV array does not have to be sized large enough for worst case weather conditions. A gasoline, propane or diesel generator combined with a battery charger can supply power when the PV array falls short. If the PV array is sized for average conditions, then during extended overcast situations or periods of increased load, the generator can be started. When batteries are low, the generator will power the AC loads in the house as well as a battery charger to help recharge the batteries. If the PV array is sized much smaller than needed for normal use, the generator can power peak loads such as doing laundry or pumping water while simultaneously run the battery charger to charge to battery bank. In addition to allowing for a smaller PV array, a back-up charging system may also allow use of a smaller battery bank. Generator and battery bank size must be chosen carefully for reliable system operation. See the system sizing section for more details on equipment choice. The Utility Interface system is used in a grid connected house. Electricity generated by the solar system is stored in a battery bank which provides all or some of the home's power. If the batteries become low, an automatic transfer switch reconnects the house loads to the utility power. Any size PV array can be used in this type of system, since utility power is available whenever PV produced power is not. Array size can be increased incrementally, requiring less use of utility power. This type of system can have a lower initial cost than a utility intertie system. It will function during power outages and can be enlarged to make the home independent of the utility. The net metering system is also used in a grid-connected house, but instead of storing power in batteries, it is sold to the utility company. The net metering system employs a special type of inverter, which inverts DC power from the PV array into low distortion full sine wave AC power, acceptable for purchase by the local utility power company. Batteries are not required for storage. The power is delivered through a kilowatt-hour (kWh) meter to the utility grid as it is produced by the PV modules. A second kWh meter is sometimes used to measure the power consumed. The user of this system will notice no difference from any utility run system, except lower utility bills or possibly payments from the power company for the excess electricity that is generated. Until recently, the net metering system requires a PV array of 1000 watts or more (12 or more PV modules) to be cost effective since the smallest intertie inverters were 1000 watts (1 kW). Recently, a new, smaller utility intertie inverter has become available, allowing systems as small as 100 watts to feed power back into the grid. Any electricity fed into the grid must be compatible with the power generated by the utility or problems might arise. Net metering system require utility power to operate, so a house of this type will have no electricity during a power outage. Adding a battery bank to the PV system would provide power during outages. 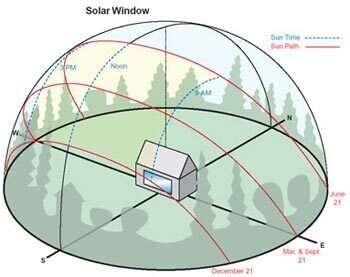 In order to determine the size and the cost of a solar electric (or wind, hydro or other alternative power system), it is first necessary to determine how much power is needed. One of the most frequently asked questions in our shop is, "How large a system will it take to run my home?" In order to answer this, we need to calculate how much power is needed. The size of a solar electric system depends on the amount of power that is required (watts), the amount of time it is used (hours), and the amount of energy available from the sun in a particular area (sun hours per day). The user has control of the first two of these variables, while the third depends on the location. Conservation plays an important role in keeping the cost of a photovoltaic system down. The use of energy efficient appliances and lighting as well as non-electric alternatives wherever possible can make solar electricity a cost competitive alternative to gasoline generators, and in some cases, utility power. Before designing an efficient system, we must look at each load and decide how we can do the most with the least amount of energy. If you know exactly what appliances you are going to use, you are now ready to determine the size of your array. Conventional electric cooking, space heating and water heating equipment use a prohibitive amount of electricity. Electric ranges use 1500 watts or more per burner, so bottled propane or natural gas is a popular alternative to electricity for cooking. A microwave oven has about the same power draw, but since food cooks much more quickly, the amount of kilowatt hours used may not be too large. Propane and wood are popular alternatives to space heating. Good passive solar design and proper insulation can reduce the need for heat. Air conditioning uses an extremely large amount of energy but it isn't totally out of the question. Evaporative cooling is a more reasonable load, and in locations with low to moderate humidity, the results are almost as good. One plus for cooling-the largest amount of solar energy is usually available when the temperature is the highest. Lighting requires the most study since so many options exist in type, size, voltage and placement. The type of lighting that is best for one system may not be right for another. The first decision is whether your lights will be run on low voltage direct current (DC) or conventional 110 volt alternating current (AC). In a small home, an RV or a boat, low voltage DC lighting is usually the best choice. DC wiring runs can be kept short allowing the use of fairly small gauge wire. Since an inverter is not required, the system cost is lower. If an inverter is part of the system anyway, the house will not be dark if the inverter fails since the lights are powered directly by the battery. In addition to conventional size medium base low voltage bulbs the user can choose from a large selection of DC fluorescent lights, which have 3 to 4 times the light output per watt of power used compared with incandescent types. Halogen bulbs are approximately 30% more efficient and actually seem almost twice as bright as similar wattage incandescents because of the spectrum of light they produce. 12 and 24 volt replacement ballasts are available to convert AC fluorescent lights to DC. Many modern tract homes have lighting systems with 12 volt halogen bulbs and use an easily bypassable step-down transformer. In an averaged sized home, the use of an inverter to supply AC power for conventional lighting is most cost effective. In a large stand alone system with AC lighting, the user might consider a back up inverter or a few low voltage DC lights in case the primary inverter fails. AC light dimmers will not function on AC power from most modified-sine wave inverters. Small fluorescent lights may not turn on with some "load demand start" type inverters. If you are not sure which type of lighting you should use, feel free to call us at 609.452.9700. Gas powered absorption refrigerators are a good choice in small systems if bottled gas is available. Modern absorption refrigerators consume 5 to 10 gallons of LP gas per month. If an electric refrigerator will be used in a stand-alone system, it should be a high efficiency type. State of the art solar powered refrigerators use 300 to 800 watt hours of electricity per day while conventional AC refrigerators use 3000 to 4000 watt hours of electricity per day at a 70 degree average air temperature. The higher cost of a good quality high efficiency refrigerator is made up many times over by savings in the number of solar modules and batteries required. Washing machines will require a large inverter unless the user is handy enough to convert a washer to DC by changing the motor and modifying the controls. Some automatic washers will run on 1500 watt inverters but for longer inverter life, a 2400 watt or larger inverter should be used. Most washers require approximately 250 to 400 watt hours per load. Electric dryers fall into the category of electric heating and cooking equipment-they are energy hogs! Gas dryers, which use bottled gas for heat and electricity for rotating the drum are a more reasonable choice. Each load dried in a gas dryer will require 200 to 400 watt-hours depending on the type of fabrics and temperature setting. In an electric dryer a similar load will consume 4000 to 8000 watt hours. Vacuum cleaners usually consume 600 to 1000 watts, depending on how powerful they are, (about twice what a washer uses), but most vacuum cleaners will operate on inverters smaller than 1000 watts, because they have low surge motors. Stationary power tools like table saws, drill presses and planers can be run on inverters of 2400 watts or more, depending on motor horsepower. Check with inverter dealers or manufactures for specifics since tools vary a great deal. In belt driven tools, motors can be replaced with low voltage DC ones of similar HP rating, but the cost is 4 to 5 times that of AC motors. Many small appliances such as irons, toasters and hair dryers consume very large amounts of power when they are used but by their nature require very short or infrequent periods, so they may be used if the system inverter and batteries are large enough. Electronic equipment, like stereos, televisions, VCR's and computers have a fairly small power draw. Many of these are available in low voltage DC as well as conventional AC versions, and in general, DC models use less power than their AC counterparts. If the electrical system is designed to deliver both AC and DC, then DC appliances can be used for maximum efficiency. Often the savings are minimal and it may be more than offset by the lower cost, increased availability, additional features, and better overall quality of the AC appliance. PES, in a very short time, has grown into a diversely experienced professional firm with a reputation for providing high quality and competitive design services. Our services have been utilized on projects ranging from minor additions and renovations to major facilities and complexes.